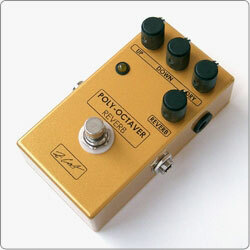 Poly-Octaver Reverb is a Polyphonic Clean Octave Up and Down Generator and Reverb in one compact pedal. It allows you to create a sound of 12-string guitar, 8-string bass or Organ like sound combined with independent Reverb effect. Please use the right power supply! The appearance of actual product may differ slightly from the image due to handmade process. If you would like to place an order for two or more pedals please contact us at zcat@zcatpedals.com or use our contact form.